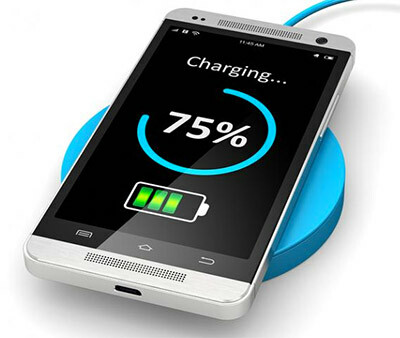 - What is wireless charging and how can I benefit from it? - Does my phone support wireless charging? - If my phone is not QI charging ready - can you upgrade it? 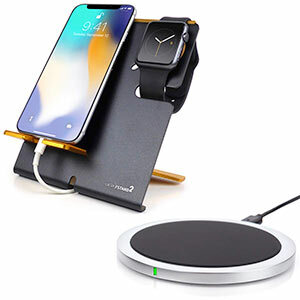 - What are the best wireless QI chargers in the market and where can I buy them? 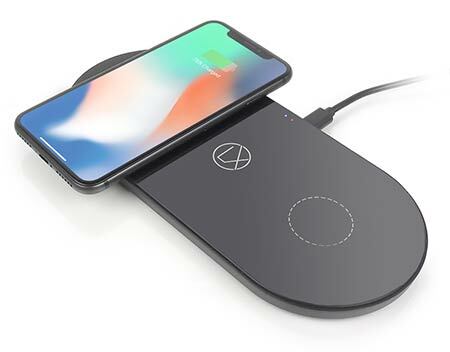 Wireless charging has gained a lot of attention recently, especially since Apple (iPhone 8 and all later models are Qi-enabled) started to support it . But it requires some knowledge to best benefit from it. Keep reading and learn all that is important to know. Is My Phone QI Charging Ready? Is My iPhone QI Enabled? Is My Tablet QI Charging Ready? Is Wireless Charging Safe or Not? Can I Use My Phone Case On A Qi-Charger? 'Wireless charging' or 'Inductive charging' is a technology that allows you to charge your phone without using a charging cable. It makes use of the magnetic induction principle discovered by Michae﻿l Faraday in 1831. On the charger / transmitter side, alternating current is sent through a coil to create a magnetic field. A second coil in the receiver (phone, tablet etc.) converts the magnetic field back into electric current which chargers the battery. This is a very convenient way of filling up batteries without the issue of plugging and unplugging cables. However, there are interface standards that need consideration before you can use wireless charging, and the most acceptable standard is called "QI" (pronounced as "chee"). "QI" is a Chinese term that means "natural energy"
"QI" is a Chinese term that means "natural energy". The QI standard was developed by the Wireless Power Consortium. It's an interface standard that describes the transferring of electrical power through induction over a very short distance up to 1.6 inches. QI is the newest and officially adopted wireless device charging standard that has been commonly used by most smartphone companies such as Samsung, Google and Nokia. As soon as your device is QI-ready, all you have to do is place it on top of the charger and – sim sala bim – your phone is charging without plugging in the cable. Pretty cool and hands-free. No more fiddling with cables. The transmitter is still attached to a cable, of course. But that's not an issue since the transmitter will typically be permanently placed where it's most convenient for you to use. If you want to use this technology with your existing device, look it up in the list of QI-ready devices below. If it's on the list you're lucky. All you need then is a transmitter or charging pad. If your device does not come with an inbuilt receiver coil, don't worry. Most smartphones can be equipped with an after market receiver. A few things to consider before you decide if this technology is a good fit for you. Wireless charging comes with many perks. But it also has some down sides most sellers of charging pads won't talk about. Very convenient: no need to plug / unplug charging cable. Especially handy when you answer calls: just pick up your phone with no strings attached. Tidier desktop: a transmitter pad looks better than a dangling cable and does not fall off the counter. There are no mechanical moving parts involved which can break like charging cables often do. Charging takes around 25% longer compared to cable charging. If you restart your phone or install a new operating system, it´s much safer to use old-school cord-charging. Receiver and transmitter must be well aligned due to the very short operational range. Potential issues when using or changing your phone case. If too thick, wireless charging might stop working. Risk of heat damage: some chargers generate a significant amount of heat during charging. The first phone ever to support wireless charging out of the box was the Nokia Lumia 920. Nowadays a great number of smartphones come with built in QI charging ability. These phones can be charged with one of the many available chargers. If your model is on the list below – you´re lucky. Just buy one of the many available QI transmitter pads and go cable-free. If your phone is on the list above - congratulations! Choose your charging pad and start charging wirelessly. If not - this list is not complete. Please double-check the official QI registered product database on the website of the Wireless Power Consortium. It has over 700 entries which wold be a bit too much to list here. If your model definitely does not support QI charging, there is still a way to go wireless: get an after-market receiver! Receivers are available for Apple iPhones and many other brands. Scroll down this wireless charging guide to see the list of available after-market receivers. Good news: iPhone 8 and iPhone X / XS / XR support wireless charging! Stand-alone receiver coils. They may not be the best looking accessory but they come pretty cheap (around $10 upward) and do the job. Phone cases with a built in receiver. A good way to get protection and QI charging in one accessory. The price range is wide, just like for generic cases, but you can get one for under $20. So if you don't own one of those - the answer is "no". But just like with the phones, you can add an external receiver to your tablet. 1. Is Qi Charging Safe For Humans? A common concern is the effect of electromagnetic fields (EMF) emitted by wireless chargers. To date, scientific evidence does not support a link between symptoms (like headaches, anxiety and nausea) and exposure to electromagnetic fields. At least some of these health problems may be caused by noise or other factors in the environment, or by anxiety related to the presence of new technologies. The radiation levels emitted by wireless chargers is significantly lower than other household devices like microwaves, mobile phones, TV sets and vacuum cleaners. 2. Is Qi Charging Safe For Your Phone? Wireless charging by design comes with a certain amount of unavoidable heat. But as long as the temperature is kept within an acceptable range (typically below 115°F), it will not harm your phone. High quality chargers (like all LXORY models) come with FOD (foreign object detection): a technology that detects metal objects placed on the charging pad. The charger will shut down when a metal object (coin, key ring..) is detected. All other slim case types (silicone, leather...) are perfectly fine and will not interfere with wireless chargers. Keep your battery charged when you're out and about with the Aircharge locator app. 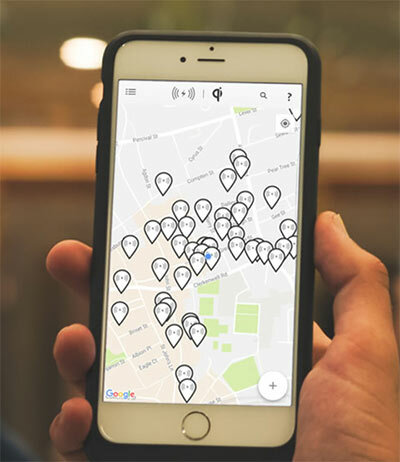 It's a wireless charging guide for Qi hotspots that gives you access to the most extensive network of Qi charging locations, consisting of more than 4,000 public venues worldwide. Find QI charging spots in cafés, restaurants and shops, airports, train stations, hotels and gyms in your surroundings. The mobile app is available for iOS, Android and Windows Mobile. 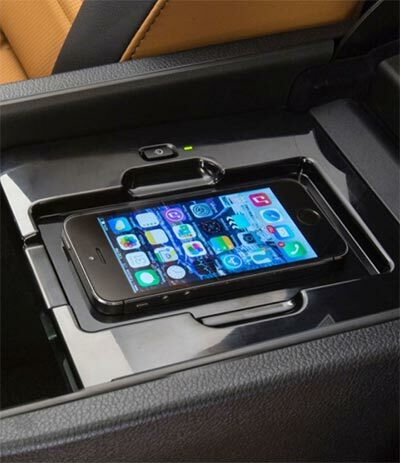 An increasing number of recent car models come with a built-in Qi charging bay. Manufactures like Audi, BMW, Chrysler, Ford, Honda, Hyundai, Mercedes-Benz, Toyota, Volkswagen, Volvo and a few more have become aware of the trend and started to equip their vehicles with wireless charging pads. But do these pads work with your phone model? In most cases - yes. As long as your phone fits in the charging bay and complies with the Qi-standard, there should be no problem. Some iPhone 8 and X owners reporteed problems with the chargers in their cars. If you want to avoid bad surprises - take a look at this Apple support page. It contains a detailed list of car models that are confirmed to work (or not work) with iPhone series 8 and X. If your phone is not on the list above and hence does not come with an inbuilt receiver coil, then you surely need an external receiver, which comes in two versions: coil pad or case. Let's take a look at the coil pads. QI add-on receiver for iPhone 7, 7 Plus, 6, 6 Plus, 6s, 6s Plus, 5, 5s and 5c. It will work with any Qi wireless charger pad and with any 3-7mm (approx 0.1-0.3 inches) thick iPhone case. Just put this piece under your case and you’re good to go. This receiver module is thin enough to be placed on top of the battery. Take off the back cover, attach the Energy Card on the battery, put on the back cover. Advantage: You cans still use the charging port as an option. 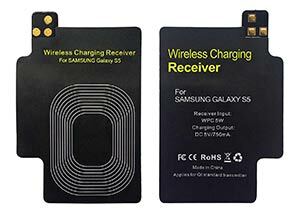 Wireless charging receiver patch specially designed for Big Size Type-C devices. Another option to get your Smartphone QI-ready is to use a phone case with a built-in receiver. This is more elegant and comfortable than the stand-alone receiver modules shown above. Because you don´t have to worry about an extra device attached to the back of your phone – it´s already built in. This wireless charging receiver case combines a protective phone cover and an iPhone wireless charging receiver in one. 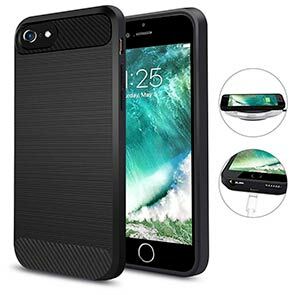 It protects your iPhone 7 Plus/6S Plus/6 Plus and also enables wireless charging. If you followed this wireless charging guide so far, you now know all about the receiver-part. Moving forward, we need to cover the transmitter-part as well: thats where your receiver gets its 'juice' from. Wireless charging transmitters come in different sizes, shapes and colours. 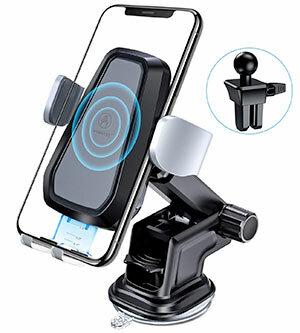 There are models to be placed flat on a desk (charging pads), charging stands that elevate your phone from the surface and even models to be used in cars. You can also get a portable battery pack with QI transmitter if you are an outdoor-person. When looking for a charging pad, you will see offers saying "1 coil" or "3 coil". What does that mean? Transmitters use coils to generate the electro-magnetic field that powers up your receiver. The receiver has to be in very close proximity to the transmitter in order to pick up the field. In order to provide a larger area of charging, some products are equipped with several coils (mostly three of them). So in general it's a good thing to have a multiple-coil transmitter. It will allow you to place your device in landscape mode and still getting charged. 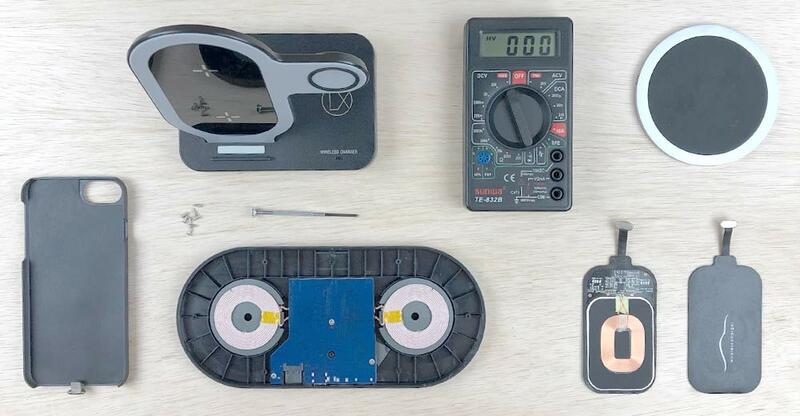 QI charging pads come in different shapes and sizes. Some have LED lights indicating the charging status. Some make sounds when you place your phone on them. But they all are made to be placed flat on your desk, cabinet or phone﻿ stand and provide the most simple solution for cable-free phone charging. This Qi transmitter is made of premium aluminium alloy. If you prefer style and quality over cheap - this one is for you. 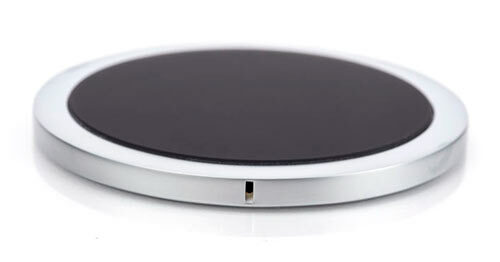 A slim & solid wireless charger that goes well with your MacBook or iMac. Set up: Connect the transmitter to a USB outlet. Place your Qi - enabled phone on the transmitter pad - done. Your iPhone is now charging with no 'strings' attached. If you have two qi - enabled phones to charge at the same time - no problem. The LXORY dual charging station comes with two charging pads and an USB power outlet to charge a third device. A 18W Wall Charger adapter is included so you don't have to worry about providing sufficient power to the pad. 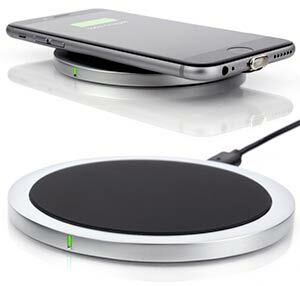 The 'next level' of wireless charging would be a charging stand. It not only charges you phone, but also lifts if off the table to provide a more comfortable viewing angle. Some stands can even add quite a bit of style to your desktop. Take a look and see what floats your boat. The options are numerous. If you own an iPhone 8 / X / XS and an Apple Watch (Series 4/3/2/1), this bundle is for you. It enables wireless charging on your phone and gives you a charging stand for your Apple Watch and phone. So you can position your devices at a comfortable viewing angle and read your messages without having to pick up your device. The charging pad can be attached to the XStand. 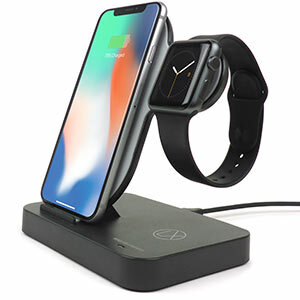 The result: a wireless charging stand for both your iPhone and Apple Watch. All you need is included in this bundle. Charge your iPhone and Apple Watch at the same time. Unlike other Apple Watch stands, the magnetic charging module for your Apple Watch is built-in with this product. So you don’t have to insert your existing watch charging cable. An additional USB output at the back allows you to charge a third device. The 2-IN-1 Design combines a charger with a phone holder in one unit. Pull down the bottom bracket to keep the phone and coils aligned. Two clips of the mount will automatically close and grip your phone when the phone is attached to the holder. To release the phone, press the quick-release button on any side - the clips will automatically open. This wireless charging guide should give you all the directions necessary to make an educated decision.